90 capsules for the price of 60! 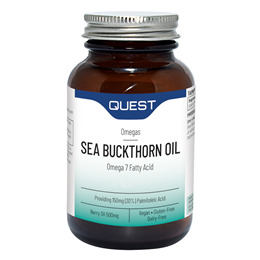 Quest Sea Buckthorn Oil contains 500mg of sea buckthorn oil. A rich source of the monounsaturated omega 7 fatty acid palmitoleic acid, this nutrient rich oil helps to support and nourish the condition of the skin, hair and nails. Sea Buckthorn Oil contains omega-7 fatty acids, such as palmitoleic acid and cis-vaccenic acid which may help support skin, mucus and eye health. Sea buckthorn also contains traces of vitamins A, C, E, F, K and B, tocopherols, tocotrienols carotenoids, flavonoids, biotin, folic acid, and various dietary minerals and trace minerals. Omega-7 is a nutritional supplement prepared from berries of the sea buckthorn plant (Hippopae rhamnoides), a shrub originating in the Himalayas. Most of the research into the sea buckthorn plant has been carried out by Chinese and Russian scientists, and sea buckthorn is widely used in health products and cosmetics in these countries. Omega-7 is also used by thousands of people across the UK for dry eyes, dry mouth and intimate dryness. Sea Buckthorn Oil, Capsule Shell: corn starch, carrageenan. As a food supplement take two capsules daily with food. Swallow with water. 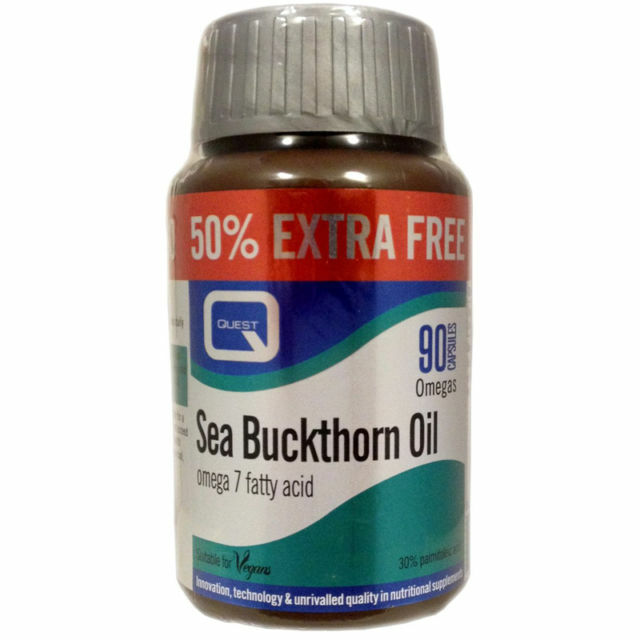 Below are reviews of Sea Buckthorn Oil - 50% Extra FREE - 60+30 Capsules by bodykind customers. If you have tried this product we'd love to hear what you think so please leave a review. Found out this is CO2 extracted, perfect, top quality item, very happy with the 50% extra free. Very efficient delivery service. Too early to tell full effect but have noticed my eyes are not so dry which is a bonus. Sea Buckthorn oil has a lot of omega 7. This is said to reduce your belly fat. I find that I am loosing about three pounds per week. Still need time to make sure. I've had trouble with recurring headaches and sleeplessness and since taking these I am certainly sleeping much, much better. I've been using these capsules for a number of years, and over the last few months I don't feel I'm getting quite the same benefit from them. I won't stop taking them, but perhaps it would be useful if the company could produce a "super" version for us to move up to as we age? I buy this for myself and for my mother, and have been doing so for a number of years. As usual from bodykind, it is very helpful to be able to buy this as a single ingredient and at a reasonable price. We both find we have to take the full recommended dose: other suppliers are more expensive and add in additional ingredients that we do not want. Great value for me, prompt delivery. I would recommend this product anyone suffering from dry eyes. Delivery excellent. A little early to comment on product, although it appears to be addressing issues such as dry mouth. Am optimistically hopeful. Sea buckthorn is a valuable supplement to me as a post menopausal woman. These are an affordable and reliable brand that work very well. I purchased this product for my mother who has had ulcerated eyes in the past and also suffers with dry eyes which can feel quite scratchy, irritated and sore. This product was recommended by a friend and my mother has benefited from using Sea Buckthorn Oil Capsules. The price of the product is well worth paying for the relief that it brings. Bodykind delivered ultra quick too. I am absolutely amazed at the difference sea buckthorn has made. Not just to my eyes but my mouth is not nearly as dry when I wake up in the morning. This product really works. If I forget to take I immediately notice a difference in my eyes. Small size capsules easier to swallow. A brilliant product that makes a real difference. I have been using it for a number of years, and have introduced two more family members to it. If you suffer with dry or scratchy eyes, and particularly if you are a post-menopausal woman, try this. Anyone above 80 years old will probably find it beneficial as well. This product is brilliant for dry eyes, I find as I work on a computer all day my eyes are very 'scratchy' and red but Sea Buckthorn keeps them moisturised and I hardly suffer with dry eyes now! Took a few weeks to see the difference but certainly worth a try if you suffer with dry eye! !